Another quiet day today. Just the day before yesterday I had up to 35 knots and the seas to go with it. Today I had hardly any wind and the little bit there was was coming out of the NE - exactly where I need to be going. Luckily the wind has picked up a little and should start to shift around to the NW soon. I am approaching Cape Town from the south because the high pressure system that lives off of the South African coast is not as wide from that angle. I should get to Cape Town Tuesday or Wednesday all being well and we should be able to finish the repairs in no more then a week. My brother, Zac, is going to be flying down which is great because he was in Cape Town last year and loved it. He knows where all the good places to go are and even has quite a few friends there. He may not be there until I leave because he has to get back to speak at the Lymphoma & Leukemia Society Regatta in Corona del Mar. I am really looking forward to having him there. I got a bit of scare yesterday when the auto pilot started acting up again. It was much worse then usual. I spent the whole day working on it going back and forth between my team and a guy from Coursemaster. It was looking like it was gone for good this time. We had tried everything and it still wasn't working. There was nothing else to do and it was pretty late over here so I had decided to get some sleep and then start hand-steering in the morning. I was on the phone with several of the guys on my team and we decided to try one last thing. I restarted the system, which is almost impossible when it's rough out - you have to put the tiller first to starboard, set that limit, then to port and then center it. The tough part is that to do this, you have to set it on the auto pilot display which is down below at my chart desk. By the time you've gotten down below the tiller is pretty much never in the right place. I have strings tied to the tiller and running around the poles on my dodger through the two little windows right down to my chart desk. I remember the first few times I had tried to restart the pilot without the strings set up, running back and forth millions of times and never getting it quite right. Anyway, this time after I did the restart and got things set up it worked! It's working even better than it did the past week - no alarms have gone off all day! It looks like I'll be able to sleep in my bed tonight! I had been sleeping at the chart desk where I could keep a close eye on the pilot to make sure it didn't start steering me the wrong way. Who knows if it will make it all the way to Cape Town but it's working for now so I'm relieved and happy! I've been working on a list of work that needs to be done and things that I need on the boat, like paper, more pens (I don't know what happens to them!) a hair brush, a kitten, my little sister, fixing my B&G instruments, a new GPS antenna, and other things like that. Nothing I couldn't live without if I had to but still nice to have. The thought of a hot shower is helping me with the thought of being on land, but while all of that will be nice, I haven't even gotten there yet and I am already looking forward to getting back out and finishing my trip! It looks like a few people think that I am ending my trip in Cape Town. Just in case I didn't make it clear enough in the last blog, I am not ending my trip!!! I am ending my non-stop and unassisted attempt. I will continue on to hopefully become the youngest solo circumnavigator. Jesse Watson will become the youngest solo, non-stop and unassisted circumnavigator. The way I see it is that we both win which is great because neither of us liked being in 'competition' with each other. Go Jesse! I have some big news today. It's not necessarily good news, but the way I look at it, it's not bad either. I am going to be pulling into Cape Town for repairs thus ending my non-stop attempt. My whole team and I have been discussing whether or not I need to stop ever since my main auto pilot died. It's one thing to sail across an ocean with one well-working auto pilot, it's another to keep going with one that is not at all reliable. It would be foolish and irresponsible for me to keep going with my equipment not working well. I'm about 10-14 days from Cape Town right now and though my auto pilot is working for now, we're all holding our breath and hoping it will last. I gave it my best shot and made it almost half way around the world. I will definitely keep going, and whether or not I will make any more stops after this I don't know yet. I admit I was pretty upset at first, but there is no point in getting upset. Whats done is done and there is nothing I can do about it. I know that some people will look on my trip as a failure because of this, and there really isn't anything that I can do about that. When you're surrounded by critics it can be hard to remember your own goals and expectations, you start to judge yourself by what other people are saying. This is the experience of a life time. It's hard and sometimes down right terrifying, but I love it out here. My boat, my team, my sponsors, and you guys, my faithful followers are all great, and I am lucky to have you all on board. This whole trip came from a dream, a dream to sail around the world, and that is what I am doing - youngest or not, non-stop or stopping. I had some nice moderate wind for a little while yesterday, 15-20 knots. I didn't fully realize that the conditions would be like this down here. Ever since I have been in the south Atlantic it's been either tons of wind or no wind. If it was earlier in the season I could go further south where the wind is more consistant but, though frustrating, it is safer up here. 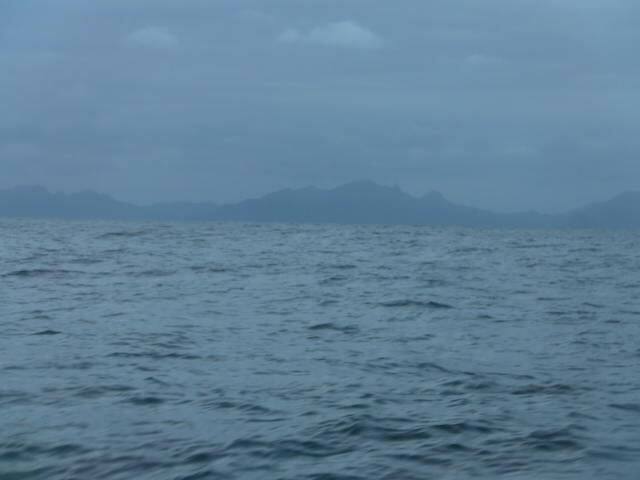 Today there hasn't been much wind and I was moving earlier but right now I have 2 knots and I am just drifting. I had a bit of a scare earlier today. I have had trouble with my auto pilot pretty much from the beginning of my trip and it hasn't gotten better with time. There seems to always be some new problem. As most of you know I am down to one auto pilot with spare parts for repairs but it hadn't been working all that great. It really seems like he had just gone insane - not correcting when I was off course, steering all over the place when I was on course and occasionally steering the wrong way. There is nothing like auto pilot alarms and accidental gybes at four in the morning to start off the day. Well, this morning my auto pilot was acting normal - normal being pretty abnormal. I was fiddling around with it trying a few different tricks that usually help it to behave a little better but this time when I disengaged the auto pilot and put it back into pilot mode it didn't work at all! I could hear the engine trying to turn the rudder, but the tiller was completely loose. I could steer with my hand while the auto pilot was engaged. Long story short I talked to my team, tried a few things but it still it didn't work. The whole time I was thinking about hand steering across the rest of the Atlantic Ocean... not a very nice thought. The great thing about auto pilots is that you can go round the clock, you don't have to stop the boat to sleep or eat, you just keep going. If I was going to hand steer I would have to stop at night to sleep which would make my progress much, much slower than it has already been. Also, hand steering on a warm sunny day is great, but not so great in the pouring rain with no sun and weather that seems to always be extreme - either no wind or a storm. I can safely say I was unhappy about the whole thing, of course I did appreciate that it had decided to act up during day light. That doesn't often happen. In fact, the last time I had serious trouble with it was about 10 at night, I wasn't able to get it going again till about 6 or 7 the next morning, and the conditions weren't nearly as nice and calm through that long night. What I ended up doing is wiring the main auto pilot hydraulic ram and engine in the back to the back up auto pilot brain box. And its working!! The new problem is that the transmission fluid reservoir for that ram has a bad leak. So now I'm working on getting the leak stopped. I am also trying to wash off the notes of which wires go where off of my arm. I didn't want to forget while I was in the back as it is the kind of place that you want to limit your trips in and out of, not the most comfortable thing climbing in and out. While I was looking at the wiring diagrams, I couldn't find any paper, and the only thing I could find to write with at the moment happened to be a Sharpie. I'm a little sore, and a little covered in sharpie, but, extremely happy to be down in the warm cabin tonight instead of out in the pouring rain! The past few days have been pretty slow. Every now and then I get some good wind but it doesn't last for long. 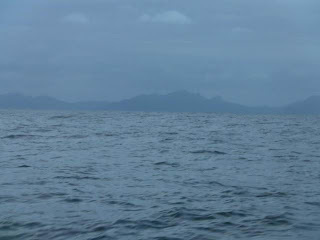 Right now I have around 5 knots out of the SW and I am going about 3-4 knots. My dad and little brother, Toby, just did a boat delivery from San Francisco to Ventura, just a few days long, but they saw tons of whales, dolphins, and all sorts of interesting stuff. I've been at sea for almost three months and all I get is flying fish and squid! I got another squid on deck today. It's been awhile since there have been any. I was surrounded by birds yesterday. There were tons of them all flying around me and Wild Eyes in a big circle. They stayed with me pretty much all day, but by the morning they were all gone. Thats pretty much the highlight of my week, birds and a squid, the rest has just been gray and rainy with unsteady wind. It has been another quiet day out here with a little more wind and out of a much better angle -SW. It was nice and warm as well - 64 degrees! Its so nice to be able a t-shirt and shorts again! Even though it's warm its grey all the time and it's been pretty foggy the past few days. I like grey, rainy weather, or at least I did back in California where there are rarely two grey days in a row! During my time down here I have had an overdose of cold and cloudy weather, of course, I'm probably going to be complaining about the heat and sun once I get home! Thanks to everyone for the suggestions for book titles! I've been thinking lately about what to call it, but haven't had any great ideas myself. PS Thank you also for the tips on repairing my Kindle. The charging port is corroded and nothing that I have tried has helped. It is just way too damp down here for non-marine electronics. My iPod has survived but I don't listen to it much and it has a Pelican case designed just for iPods. Another slow day today with pouring rain and so foggy that I could barely see the bow of the boat this morning. It did clear up a little bit later on and the wind picked up a little but not much. I've had around 10 knots for most of the day. Not that great, but it's coming out of the NW, pretty much ideal for heading east. There is something about heading the right way, even if you're not going all that fast and it's cold, wet, and gray. It's so indescribably awful to not be able to head the right way, or even drifting backwards. After one bad night like that it doesn't matter how fast you're going! Just as long as you are going the right way! The wind should pick up a bit tomorrow and I'm hoping to get a few good days of easting in. Sorry there haven't been any pictures on the blog lately, I have been having some trouble with my camera. I'll get some more up as soon as I can! My Kindle has finally broken. Right when I was in the middle of a good book too! I do have a few books I brought along just in case something happened to the Kindle, but with the way I read I don't think I'll have enough to last the rest of my trip. I'm reading "Do Hard Things" by Alex and Brett Harris right now - it's a great book! I also just started working on my book today. I'm kind of having fun with it! I'm glad I'm staring to work on it now, I think it would be a lot harder to write it if I waited until I get home to start. Abby knew that you all would be concerned if she didn't post a blog tonight but she was pretty wiped out so asked if we would put something up for her. She has gone from frustratingly light winds to nice 20s, to more challenging 30s out of the NE which caused her slightly southward track yesterday. She has had a series of cold fronts that have brought pouring rain, heavy winds and gusts as high as 40 knots. Tonight's forecast is for 25-35 knots of wind with possible gusts of 40-50 knots. She is sailing under staysail alone tonight for safety, though during the day she carries a triple reefed main sail as well. She likes the speeds and the surfing conditions. The guys over at Commander's Weather are amazing. Abby loves her forecasts. She says they are like driving directions. 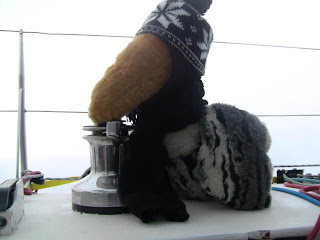 Their meteorological knowledge and routing experience have kept her with a nice balance of safety and good winds. She is becoming very knowledgable about weather systems and patterns...among many other things, especially electrical systems (thanks Scott and Jeff!). 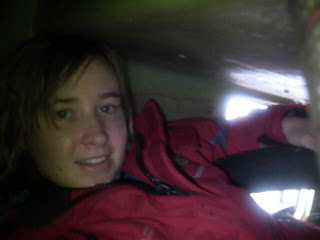 Last week she had an email from Laura Dekker, the young lady out of Holland who is hoping to begin a solo circumnavigation this summer, Karen Thorndike, the first American woman to solo circumnavigate as well as keeping in touch with Alessandro di Benedetto, the amazing Italian solo circumnavigtor, and Jessica Watson, whom by now all of you must know! Speaking from a mother's point of view, I have to say that although Abby wouldn't mind some warmer weather and sunshine, she is really enjoying her trip. She has passed from the honeymoon/thrilling phase to the reality/marathon phase. Every time I say to her that I wish I could transport her for the day to come home for some TLC - she declines the offer! So rest easy dear bloggers. Our girl is well and hoping for a bit more sleep tonight. I know there are a lot of people praying for Abby out there. Tonight would be a good night to pray for her to have a safe night. It has been a nice day out today. I've had about 25 knots most of today and have been moving along nicely close hauled and going about 7.5 knots. It was really warm today. It got all the way up to 59 degrees out! I had to take my sweater off! Things have been pretty normal out here lately, I've lost my hair brush again, my boots are still wet, and I still haven't caught any fish. Since I don't have a whole lot to write about tonight I thought I'd answer some questions from the blog. How is the school work going? School is going alright although I actually haven't done much at all. There always seems to be something more urgent to do out here. I know sailing around the world alone may not really be the sort of thing that will help me when I get back to school or in college, but, I am learning a lot out here even if I haven't been doing much history and science. What are you eating and will there be enough if the trip is longer then expected? My food is pretty much all Mountain House dehydrated food with some dried fruit, nuts, energy bars and, of course, chocolate! I haven't eaten nearly as much as my mom, Kristi Morrell, my dietician, or Melanie from Mountain House thought I would be eating. So I will still have plenty of food if the trip is longer then expected. What system do you use to get Internet, how long can you be on the Internet? I have a Thane and Thane Sailor 250 satellite system to go online and I can go on pretty much go on whenever I need to. I get charged by the megabyte so I do have to be careful not to use too much. GMPCS has sponsored me for some of my airtime which really has helped alot so thank you again to GMPCS! Well, its pretty late over here, so I'm going to get to bed. After a few days of light winds it has been a nice day out here with 20 knots of wind and 15 foot or so seas. We're sailing along at a nice 7.5 - 8 knots. I'm headed NE and planning to get some good northing in as quickly as possible. I saw land yesterday for the first time in, I'm guessing, two months. The land I saw was Staten Island, just east of Tierra del Fuego and the Strait de le Maire. It was a little terrifying to be so close to land after so long as you are constantly watching out for it, but it was very exciting to see! It made me miss being on land a little bit... but not that much. I'm still very happy out here! 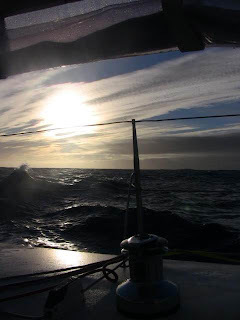 It's very exciting to have finally rounded Cape Horn and to be in a new ocean. It's great to have started another big leg of my trip. Repairs are going well. My water maker is working and so is my auto pilot, though we're still working on fixing my main auto pilot. It will be nice to get up into warmer water and sunnier weather. Well, the wind is beginning to die again so I'd better go pull up some more sail. After much long and lengthy discussion, Team Abby has decided that to be certain that everyone in the official yachting world fully accepts the fact, that you truly sailed around the world solo... we have decided you will need to sail around the world twice, just to prove to them that you indeed actually did it. But... now, don't freak out... hear us out on this... At least on the second lap, you will be able to do it on the equatorial route where it will be much warmer. See, that's not so bad now, is it? I know, this sounds like a really big deal, but they assure us it really isn't because the Coast Guard and Navy already have ships on station in the Indian Ocean, and they are bored out of their minds because the pirates are really hard to find... and they figure that Wild Eyes would be a lot like honey attracting bees... it will draw the pirates out so they can capture them just before they get to you. But, it get better... since they know you are bored out of your mind at times as well, they have agreed to tutor you, via the VHF radio, in all that school work you have been so carefully avoiding on your first lap around the world. Just think, with the Coast Guard sailor's help and encouragement, you might actually get through your freshman year of college too! And, just in case the pirates slip by the Coast Guard and manage to kidnap you anyway, we have started a PayPal fund, managed by Jeff, to raise the ransom money we will use to buy you back. Jeff reports that so far, he has raised $38, which we all feel should be plenty of money, we hope. See, so it's not looking so difficult after all is it? Think of all the benefits... a tan in the tropics... lots of (hopefully cute) guys, just a little older than you, to chat with for days on end. Who knows who you might meet?